In this expert level 5-day training course you will be exposed to advanced networking and Citrix ADC concepts and configurations. 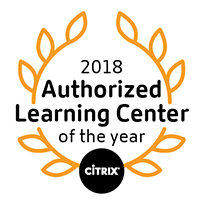 Through lecture, lab exercises, and real-world case studies, you will learn to look critically at environment requirements, constraints, and business drivers to create a complex Citrix networking solution. Topics to be covered in this course include multi-site and multitenant deployments, advanced authentication and load balancing, and automation and orchestration and advanced troubleshooting. This training will also prepare you for the Citrix Certified Expert in Networking (CCE-N) exam. Built for IT Professionals with extensive networking and Citrix ADC experience. This course is built for IT Professionals who are responsible for defining the overall structure or architecture of a Citrix networking environment. This course encompasses advanced Citrix networking configurations and leading Citrix design principles. This course assumes that the student has significant networking and Citrix Networking experience. Citrix recommends a comprehensive understanding of basic and intermediate Citrix ADC features and functionalities. Proficiency in the topics covered in CNS-220; CNS-222; and CNS-320 is strongly recommended. This course helps prepares candidates to get the CCE-N certification.